My wonderful Gypsy has welped 5 beautiful little pups, 2 Males and 3 Females. GYPSY IS OFFICALLY RETIRED FROM THE SHOW-RING AND HAS TAKEN A GREAT LIKING TO SLEEPING ON THE BED WITH MY HUSBAND AND I. Gypsy is a stunning little girl with heaps of personality. Gypsy is a outstanding quaility little Girl, who loves to strut her stuff in the show ring. Gypsy has also proven herself against older Shih Tzu's in the ring. Gypsy has now obtained enough points to be a Australian Champion at the tender age of 8 months!!!!! 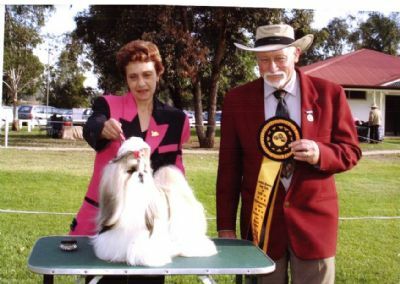 Gypsy wins Best of Breed at Canberra Royal 2007. 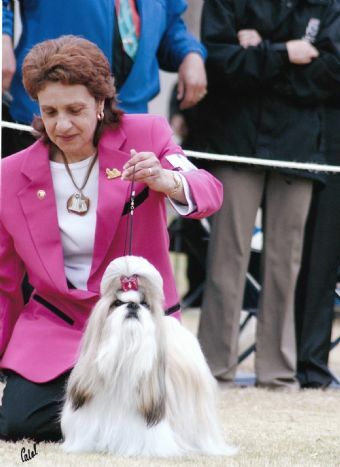 Gypsy wins BEST IN SHOW at November 2007 Shih Tzu Specialty. Gypsy wins BEST IN GROUP AND INTERMEDIATE IN SHOW (CHRISTMAS SHOW) 22 DEC 2007.